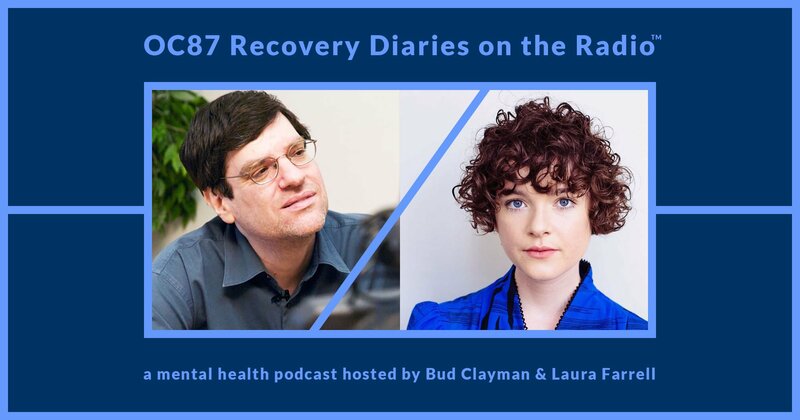 In this first ever podcast episode of OC87 Recovery Diaries on the Radio, join Laura Farrell and Bud Clayman as they interview each other about their own mental health journeys. We invite you to listen in as we discuss our own bouts with trauma and how we have used EMDR (Eye Movement, Desensitization, and Reprocessing Therapy) to cope. We also read from our own first person essays, which appear on the OC87 Recovery Diaries website. 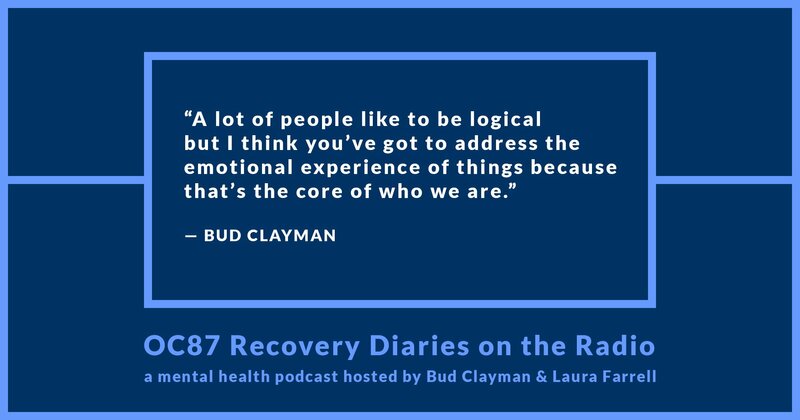 Laura speaks candidly and thoughtfully about her battle with PTSD and sexual assault, while Bud reveals his journey of learning to trust again after a bitter emotional trauma that occurred in his own life. Recording this episode was a significant emotional experience and catharsis for both of us. Recording the first episode of the podcast and sharing my personal mental health journey was both an exciting and nerve-racking experience. 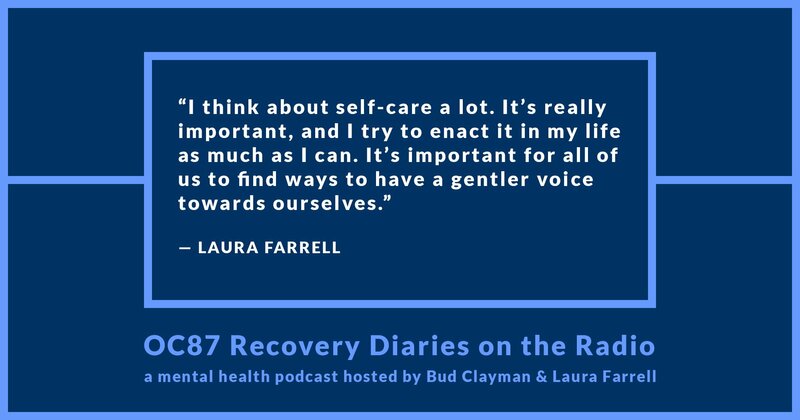 The message and mission of the podcast is so important, but disclosing personal information about my mental health and experiences with trauma is something that produces anxiety within me. This is elevated by the fact that the podcast is a personal project—something we want to feel proud of sharing. I think it is crucial to have conversations about these things and I feel fortunate to have a platform to do so, nonetheless it is an experience that can create fear—will what I say be clear and relatable? I cannot let my fear prohibit me from doing this work. I am fortunate to have a co-host & co-producer who helps create a safe space to begin these discussions. I am excited to continue working and starting a dialogue around mental health that I feel is urgent to have. Doing this podcast brings me back to my routes in radio. When I was seventeen, I recorded the 3:00pm Sunday news for a Jewish magazine format radio show. I started out wanting to be an announcer before I got into filmmaking and writing. When Laura came to me and said that she wanted to do a podcast, I was leaning towards other projects at the time. But her enthusiasm and drive won me over and I was completely on board to help co-host and co-produce a show dealing with mental illness. I particularly like this first episode because Laura and I have both been through traumatic experiences and, as a result, have to deal with similar issues of trust and interdependency. I think we both understand how the world can come crashing down on you and how devastating it can be to have to pick yourself up again and go on with life. What I most admire about Laura is her kindness. And she remains kind despite going through a horrendous event in her life. In EMDR therapy, her trauma would be considered high level, whereas mine would be a smaller level trauma. Paradoxically, I think she is more open and accessible than me, even though what she went through was more severe. I guess we all experience things differently and I hope Laura continues to remain positive. We hope you will relate to our discussions and our guests in the weeks and months ahead. Thanks for tuning in to OC87 Recovery Diaries on the Radio. Episode 2 - Art and Mental Health: Can They Co-Exist, or Must They Compete?